I wrote here last year about Aldi’s white vinegar. It’s your basic distilled white vinegar with 5% acidity, good for cooking, using in salad dressings, or using for general household cleaning or unclogging drains. My only complaint last year was that Aldi sold its distilled white vinegar only in a small 32-ounce (1 quart) bottle. This bottle fit great on my pantry shelf, and it contained enough vinegar for cooking purposes. However, with vinegar growing in popularity as a cleaning agent, I usually needed to buy several bottles of Aldi’s vinegar in order to have enough for both cooking and cleaning needs. 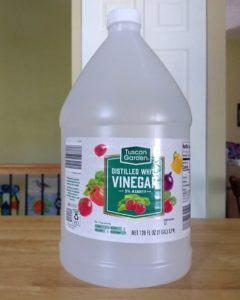 The problem was that I could buy a bulk one-gallon (4 quarts) bottle of store brand Great Value vinegar from Walmart for $2.48, which comes to 17 cents less per quart. It actually cost more money to buy multiple 32-ounce bottles of the Aldi vinegar vs. one large one-gallon bottle of big box store or traditional grocery store vinegar. It was one of the few times when Aldi’s price was actually higher than other stores’ prices. Then, while I was strolling through a newly remodeled Aldi store in my area the other week, I noticed Aldi now offers distilled white vinegar in two sizes: the original 32-ounce bottle for 79 cents, and also a one-gallon bottle for $2.39. The gallon bottle costs 9 cents less than the gallon bottle from Walmart. Thus, Aldi now has the lowest price for vinegar. Aldi’s Tuscan Garden Distilled White Vinegar is fine for cooking and household cleaning. 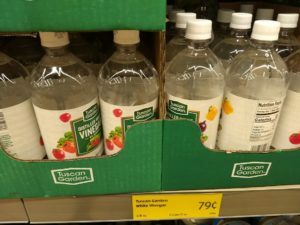 It used to only be available in small 32-ounce bottles, and if I was buying in bulk it was cheaper to purchase store brand vinegar from Walmart or other big box stores rather than buy multiple bottles of Aldi’s vinegar. 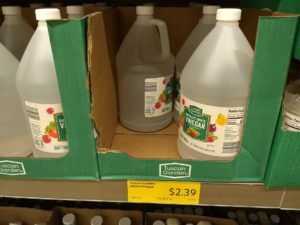 Then, Aldi began selling one-gallon bottles of vinegar for a few cents less than the Walmart brand. Once again, Aldi is the winner in the price wars.